We saw one of the seven wonders of the world, we hiked up and down a mountain in the jungle, we ate deliciously fresh, exotic food (I can't describe how amazing unprocessed food tastes like), we met young, wander-lust travelers just like us, who shared stories of incredible adventures both in traveling and business. Let's just say...we had the time of our lives! 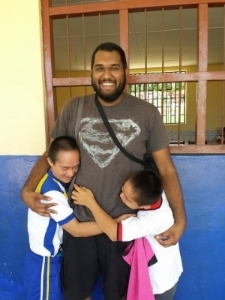 But, nothing, and I mean nothing compares to our visits to the special needs school in Tarapoto, Peru. That experience alone, has changed my entire perspective of life and has given me a clear sight of who I am as a person, who I want to be, and my purpose as a human being. Here is my story. 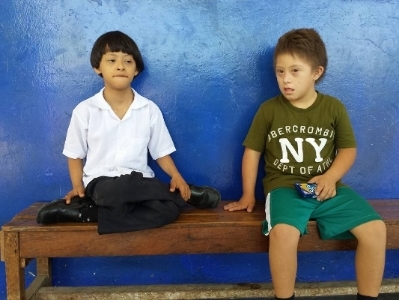 I anxiously walked down a dirt-paved hall guided by an excited and grateful, middle-aged woman who welcomed us to her special needs school with open arms. I reached the end of the hall and to my right, I was greeted by a large crowd of the most innocent and adorable looking faces my eyes had ever seen, their arms stretched out, waiting to hug and kiss me on the cheek. The psychological and physiological effects were like nothing I had ever felt before. I felt as if a bullet of happiness was shot through my chest and the strong, tingly feeling had spread through my limbs like lighting. Here, amidst the jungles of Tarapoto, Peru, is where I felt an extreme sense of fulfillment. This is the part in the story where I, as a human, knew exactly who I was, and what my purpose in life was. I was never so sure in my life that I had to do everything in my power to make a difference in their lives. As we took a tour of the school, and witnessed all of its terrible conditions, I couldn’t help but feel a sort of sadness and a beautiful empowerment, as I knew that this was the school where my mother taught while she carried me to term, and here I was, 24 years later, saving it. After such an experience, I was eager to come home and deliver as many presentations as I could. The anxiety caused by public speaking has evaporated form my veins, it has been replaced with passion, purpose and just...love. I have finally found what I was looking for, something that I loved and had a strong passion for. Something that I have searched through years both during college and after graduation, going through the terrible and depressing uncertainty of 'what in the hell' I was going to do with my life. I have learned that we have to be brave enough to dig deep down to find what makes our soul sing and jump towards it, regardless of the fear. Our first mission in Peru was complete! Since we where already in the country, there was no reason not to explore it. Now this is the place where beings from all over the world, from all different backgrounds, ages, beliefs, social status etc. come to visit. Think of going to Disney World and seeing tourists from all over the world...this was similar, but 1000X better (no strollers allowed). The view is unlike anything I have ever seen before. I have never felt so insignificant yet so inspired! Let’s just say, we had a blast in Tarapoto. This small city is located amidst the jungles of Peru, where everyone knows each other and everything is a short walking distance away. The city is surrounded by incredible landscapes where beautiful green mountains and waterfalls are only a car ride away. We had the great opportunity to be shown around by locals who were the same age as us. It was awesome to see how alike we were despite growing up in completely different environments. One of our most memorable experiences is hiking up and down a mountain that required the use of all of our limbs. It was the most extreme thing any of us had ever done. My legs were shaking, my heart felt like it was going to burst, the pain serving as a bitter reminder that I should have performed more cardio in my life. Nick conquered his phobia of steep heights (it took him 5 minutes to even start climbing down one of the giant ladders). I slipped and landed on a rock, luckily, my elbow broke the fall. Conquering our mental/physical discomforts and seeing the incredible views while experiencing a huge rush of adrenaline was the cherry on top of a great trip. We all hummed the Rocky song as we climbed the last steps of our hike, happily checking off another item on our bucket list. This is the trip that I will be telling my grandkids about, encouraging them to venture out, explore the world, learn from new people, and give back. There is a cat park in Lima, Peru. The 24 year old CEO who is killing the game!